This article originally appeared on The Trek, which you can find HERE. You might think from reading most of the information available on the internet that there are no couples thru-hiking, and that hiking with a partner is an all around bad idea. Not true! There are tons of couples hiking the long trails, and I’m here to say I think it’s a great idea. No, it’s not always easy. 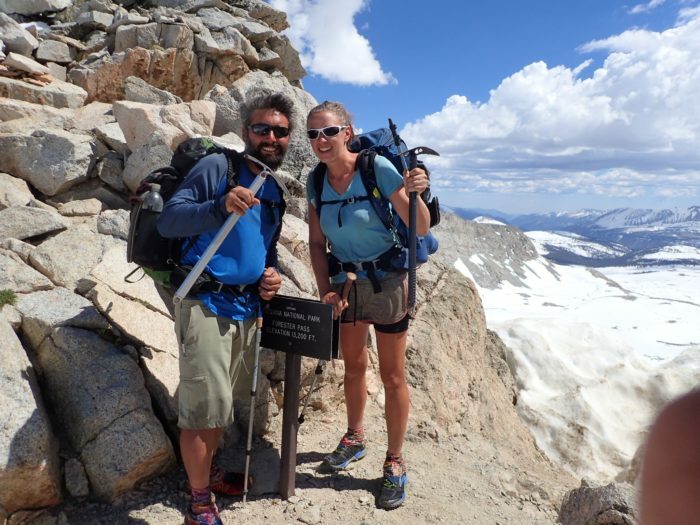 Yes, there are additional challenges and considerations that the solo hiker doesn’t have to deal with or worry about. Still, hiking with a partner can be a rewarding experience that brings you closer together through awesome and challenging shared experiences. 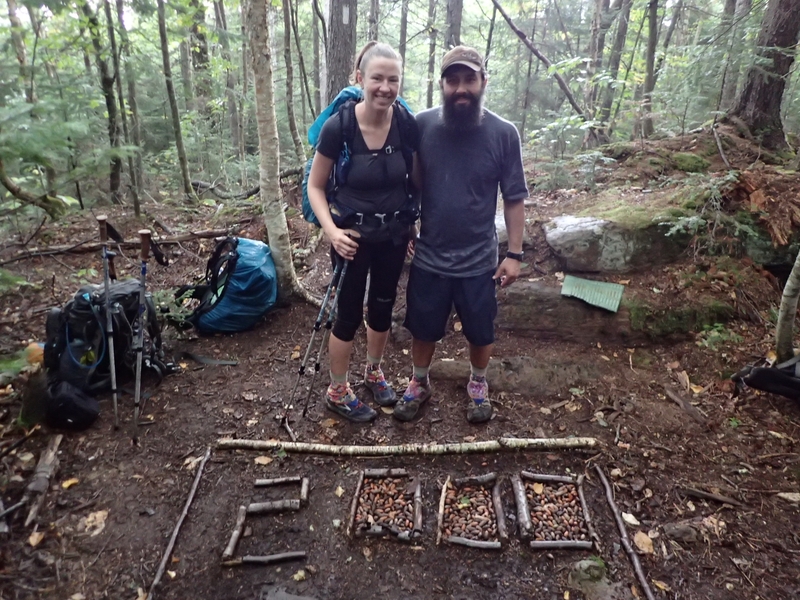 My husband Paul and I have hiked together for over 4,000 miles now. We’ve gotten in some nasty fights and had plenty of frustrating days. Most of the time though, we have a great time together and we have come to work really well as a team. I don’t get to “hike my own hike.” We get to hike our hike. We both have to compromise a little bit every day so that we both get the experience we want out of the hike. I’m still no expert, we still get in fights, we still have days we struggle, but we are always working to get better, and we’ve only gotten closer as the miles have piled up. Here are a few tips I’ve learned to have the best time together. Most likely, one of you hikes a little faster than the other one. While I love to get my blood pumping on a good uphill, and get in a zone until I get to the top, Paul abhors them and stops for breaks every few minutes. On the other hand, when we are on rocky terrain or a steep downhill, he flies down while I trip and kick rocks every step of the way. Pacing becomes the thing we fight about probably the most on the trail. As the generally faster hiker, I’ve learned that it’s usually best to stay in the back (but don’t trailgate). That way we go the pace that the slower person is comfortable with. Sometimes though, we want to go fast or do bigger miles, so I take the lead and try to set a pace faster than his typical pace but still one he can keep up with. It requires a lot of communication to know when it’s appropriate to push it, and when it’s best not to. I also have to be reminded when I stop to let him catch up to me, not to take off again right away. He wants a rest too. Having shared goals is probably the most important ingredient for success in any relationship, both on trail and off-trail. 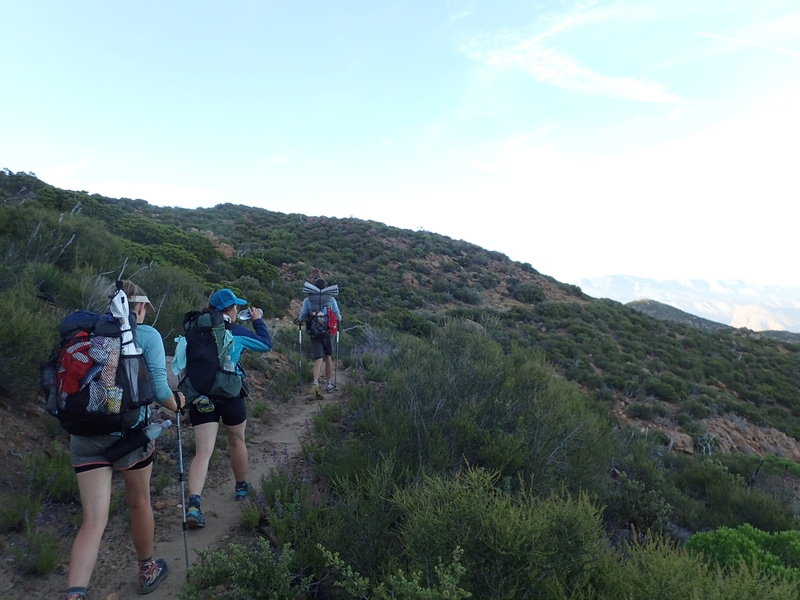 Is the goal to hike every inch of trail, or are you okay with skipping or doing alternates? If one of you gets injured, will the other one keep hiking? Are you planning on a fast hike with few town breaks, or are you interested in seeing as many trail towns as possible? What kind of budget do you have in mind? How many miles per day will you start with? All of these questions are important to figure out before you get on the trail. Once you are on the trail, you have to keep communicating about these things because your goals shift. If we are pushing big miles every day, one of us might start getting tired and ask if we can take it slower for a few days. If we want to hike our new biggest day, we both have to be on the same page so we get up early, take shorter breaks, and don’t waste time. Having shared goals helps to make you feel like a team and encourages working together. When one person is having a lousy day, the other person can pick up the slack a little bit. We can carry a bit of their load, or take care of more of the camp chores to make that person’s day a little easier. We lean on each other and we get through this together. Everyone gets hangry sometimes. Knowing that you are hangry and not taking it out on your partner is a little trickier. If you are hungry and cranky, say so. Take a break, eat a snack, and get back to it. It really is easier than getting into an argument. If the pace is too fast and you are getting frustrated, say so! Take a break, take the lead, and get back to it! Just about every fight we have on trail starts with trivial things like these and escalates from there. The stress of hiking all day wears on all of us sometimes, and it helps to be able to step back and recognize you’re just having a bad day or a bad time rather than taking it out on the person in front of or behind us. Sometimes we all need a little alone time too. Some days we give each other more space and each hike on our own a little. We stay within earshot or within sight, but we don’t have to be right next to each other, we don’t have to talk, we just hike and enjoy our own time. One of the best things about hiking with a partner is sharing gear. We both get to carry a lighter load because we have one tent, one filter, one stove, and so on. Another great advantage is splitting up the camp chores. While solo hikers have to gather water, set up their tent, and cook dinner all on their own, we get to split it up. You set up the tent and blow up the sleeping pad, I’ll filter water and get dinner started. We change up who does what based on how tired we are or if one person is having a better day than the other. The important thing is we share. No one wants to do all the chores while the other socializes. This is inevitable on the trail. We meet so many like minded people that become true friends. Because we spend so much time together, it is really important to mix it up and hang out with other people. Some days we are getting on each other’s nerves and stop for a break to hang out with friends, and both of our moods improve and we start getting along better. I’ve also noticed that Paul will hike much faster if he is having an interesting conversation with someone else, especially someone new. I like going fast, but I know he wouldn’t keep that pace for me day in and day out! Having someone else around to motivate him is great. I can’t imagine hiking without Paul. We’re partners, and even though we don’t always get along, the trail has made us a stronger team. So don’t listen to the naysayers out there, get your packs on and get hiking. Together.